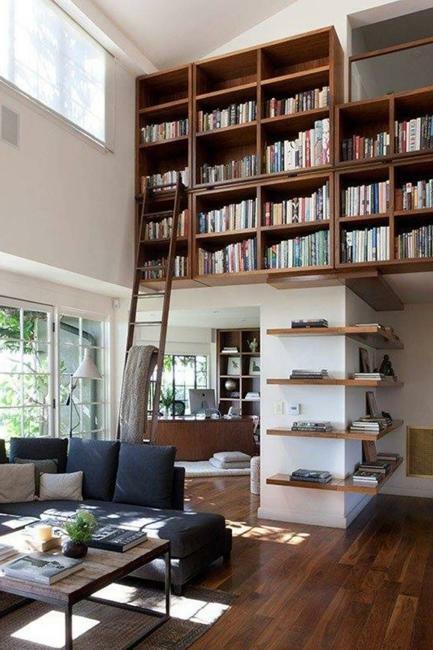 Ladders are handy in home libraries. They help access all shelves and find a book you need. Metal and wooden, vintage and modern ladders make a task quick and easy. 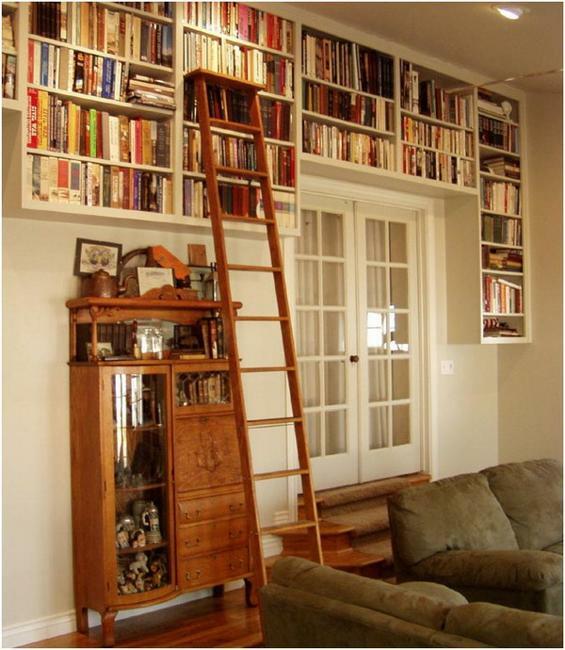 Step ladders in old styles, rolling ladders, and built-in stairs that lead to the second floor are practical ideas for attractive book storage. 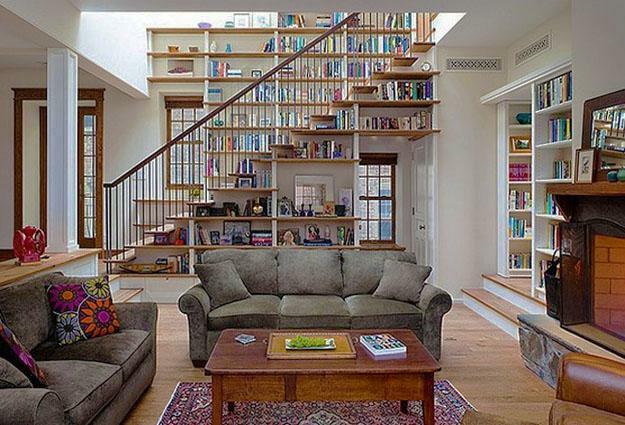 A ladder adds interest to the home library, improves safety and functionality of the interior. 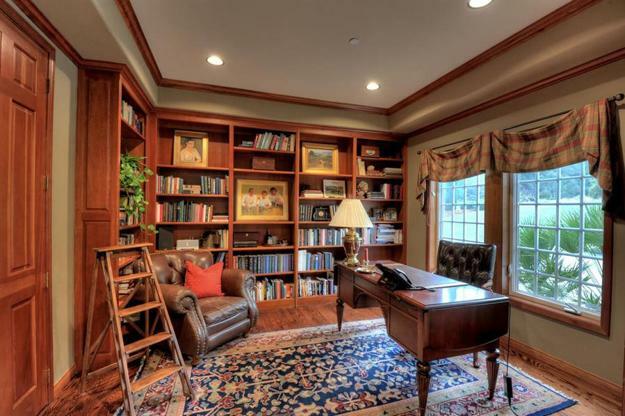 Lushome shares inspirations and tips for creating beautiful, comfortable, and safe home libraries. 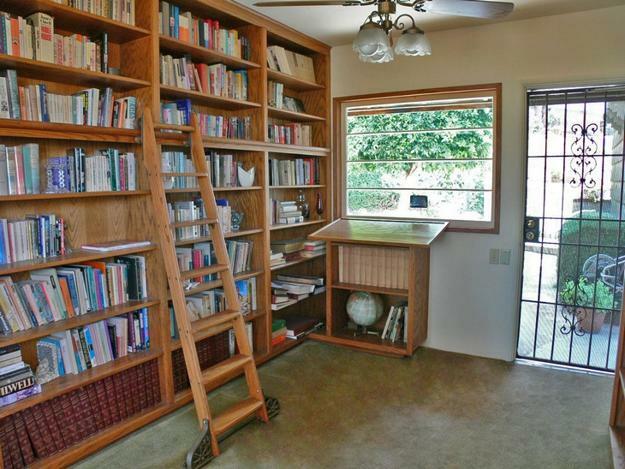 A step ladder is versatile, suitable for many tasks outside a home library. From changing light bulbs to accessing shelves in kitchens, step ladders with a traditional A-frame are durable, stable, and safe to use around a house and outdoors. Ladders with metal hooks that slide along a bar and rolling library ladders with wheels give a nice touch to home library designs. The hooks and wheels attached to the ladder allow safe gliding along a bar. Contemporary metal, composite, and wood ladder designs are attractive and elegant. Rolling models are versatile, suitable for interiors in classic, ethnic, and contemporary styles. 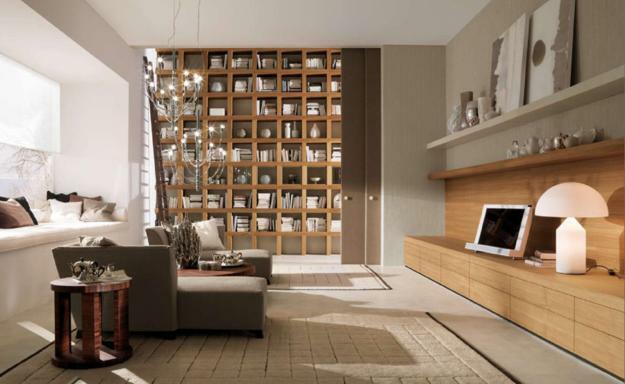 They add chic to home library designs, improve book storage, and make the interiors comfortable. 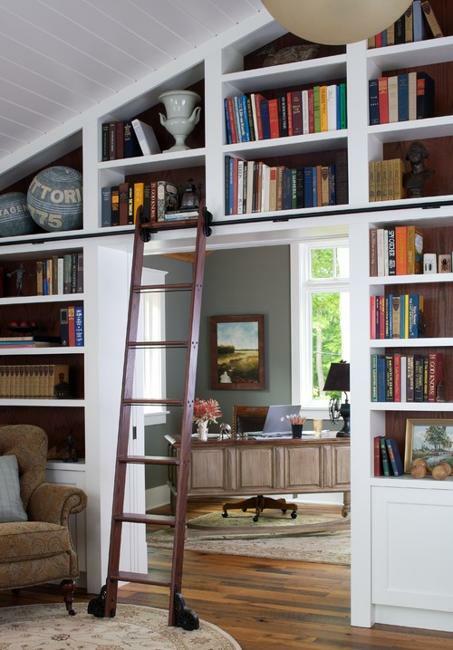 Rolling ladders are essential parts of floor-to-ceiling libraries and spacious office designs with tall bookcases and shelves. They are beautiful additions. They look elegant while improving interior design and setting a stylish atmosphere. 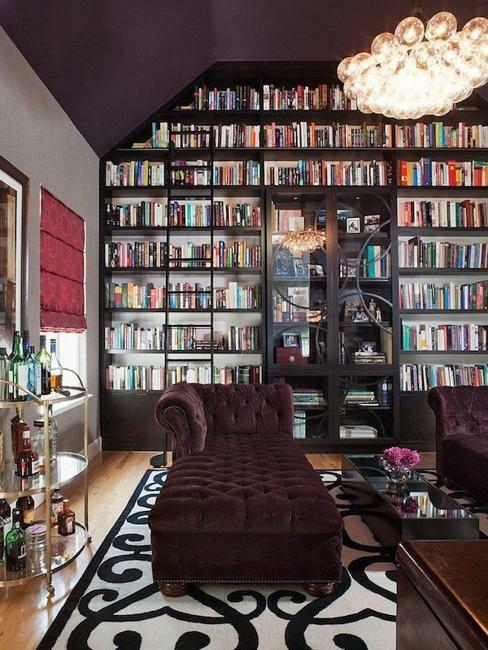 Many large home libraries have open shelves under the ceiling and around the windows. 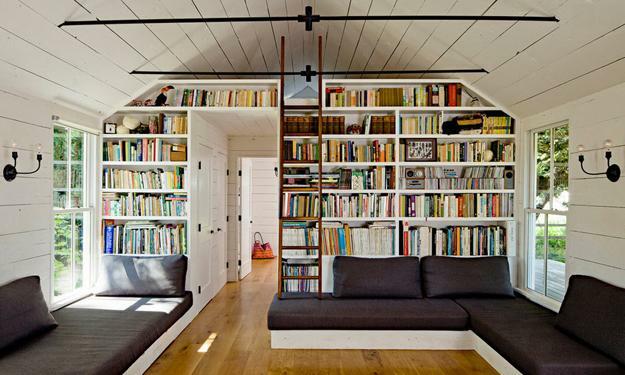 Efficient usage of space calls for utilizing all small spaces. 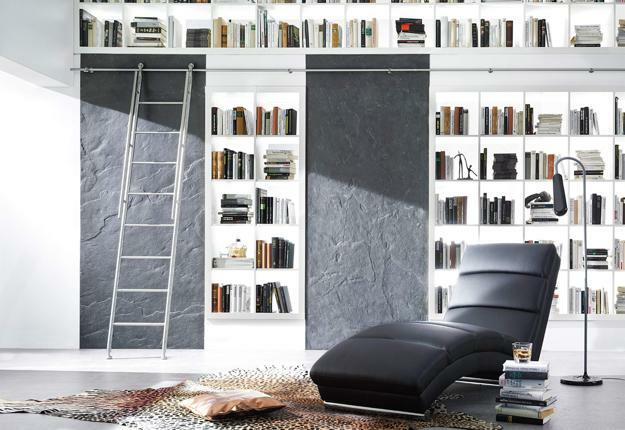 Safe, beautiful, and modern ladders help create functional and comfortable libraries with floor-to-ceiling wall shelves. Wood steps in vintage style are fabulous. They often feature unique designs and fantastic craftsmanship. Made of solid wood steps are elegant and exclusive. 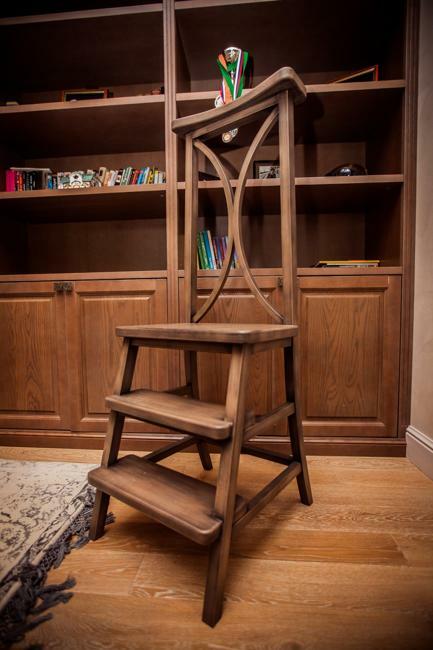 Traditional step ladders are heavy and can be too small for extensive libraries, but they are perfect for designing small spaces. 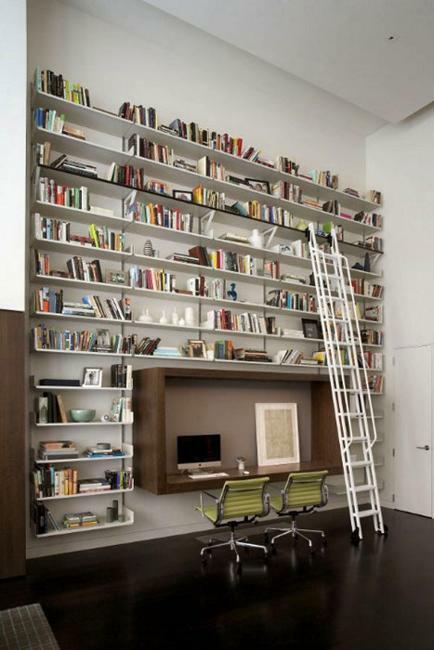 A rolling ladder replaces the need for an old step ladder and gives a modern touch to home library decorating. A roller system on the top and bottom and a railing system for sliding are two types of new step structures. 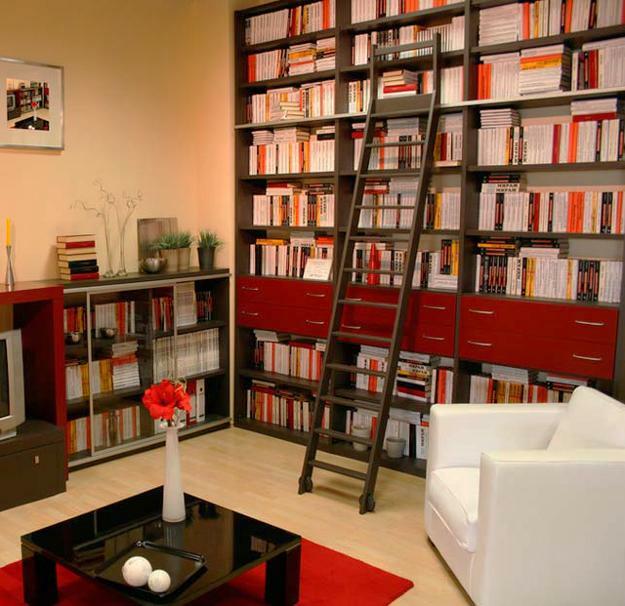 These systems allow moving a ladder from side to side to access a wide area of book storage. Sliding and rolling ladders can be permanently mounted to the bars and offer removable models that are stored somewhere when not in use. 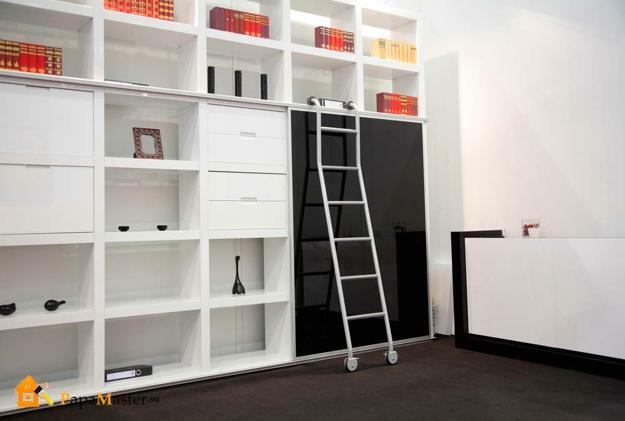 The ability to move around without having to step down from a ladder makes these modern designs so functional, convenient, and desirable. It is a small thing, but once you experience sliding along a bar the new ladders with a rolling or sliding system become your favorite. 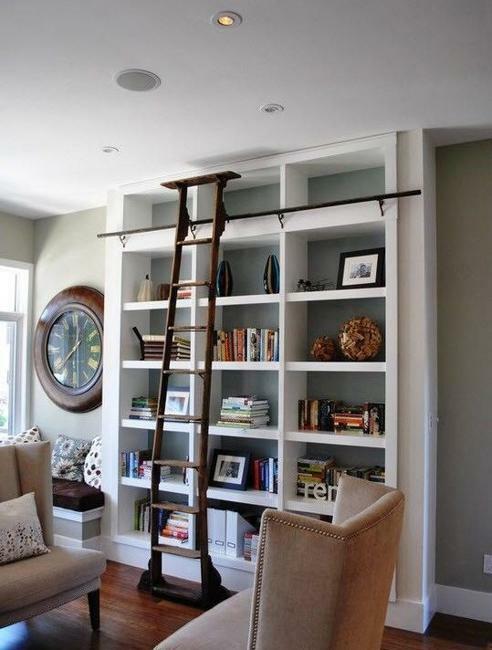 A simple ladder can hang on a wall or stay in a designated area in a home library. One important thing is safety. Movable library steps need to be durable but light. 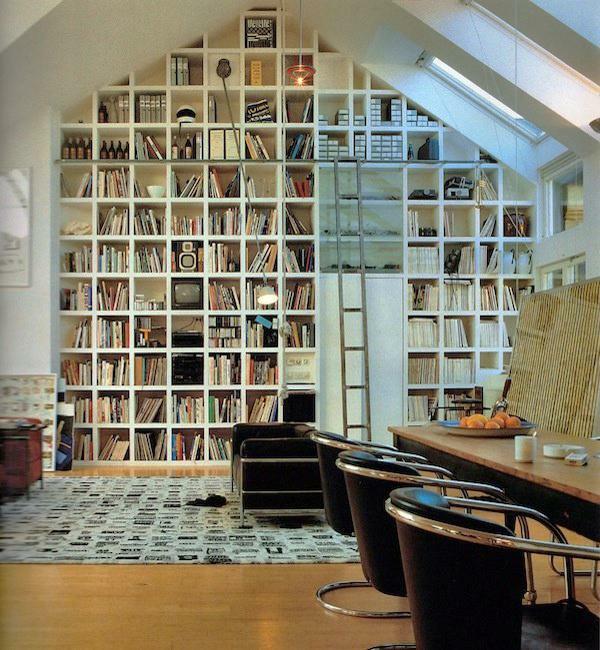 Their storage spaces need to provide enough room to transfer the ladder to another wall. Modern ladder designs are convenient and safe. Contemporary railing systems allow moving steps without lifting and setting on a different rail. 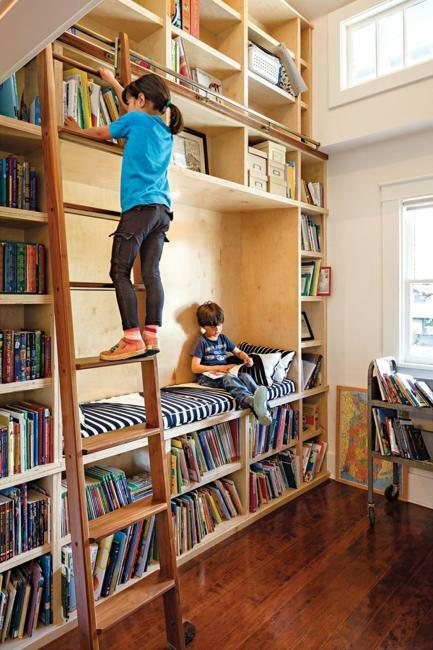 Staircases with wall shelves for book storage are the safest design. 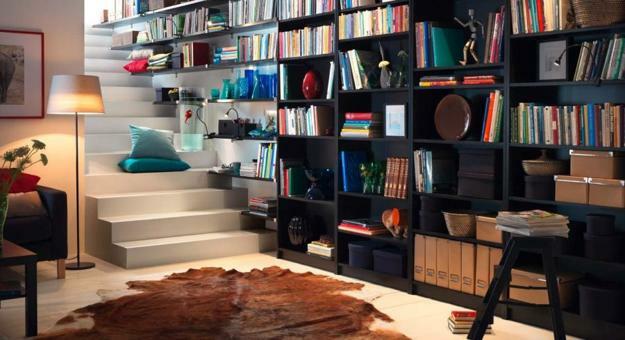 Staircases with bookshelves are space saving and beautiful. 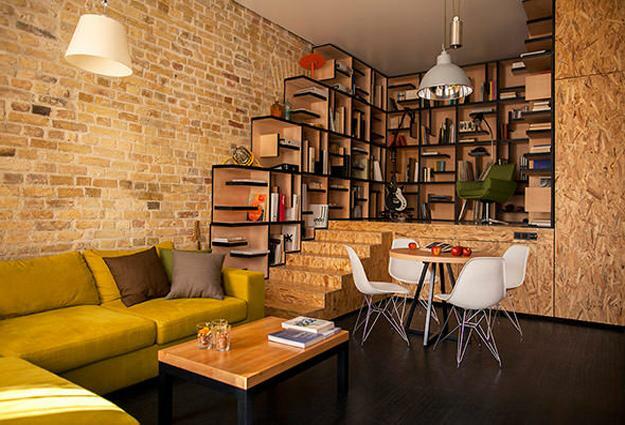 They improve functionality and look of interiors creating attractive and comfortable open spaces. 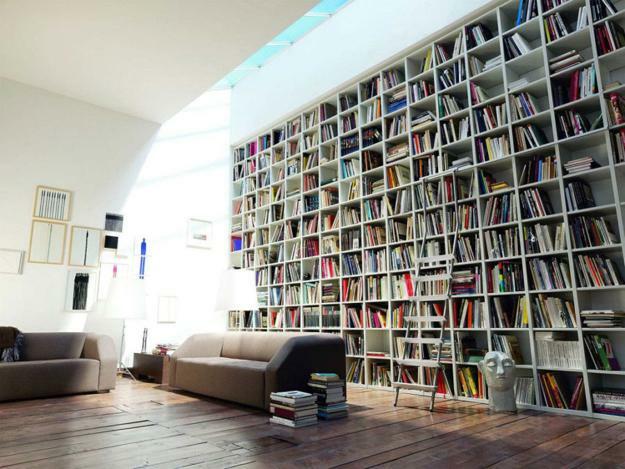 Selecting the best ladder for your home library is not an easy task. You need to try climbing and down, moving a ladder and see how it feels. 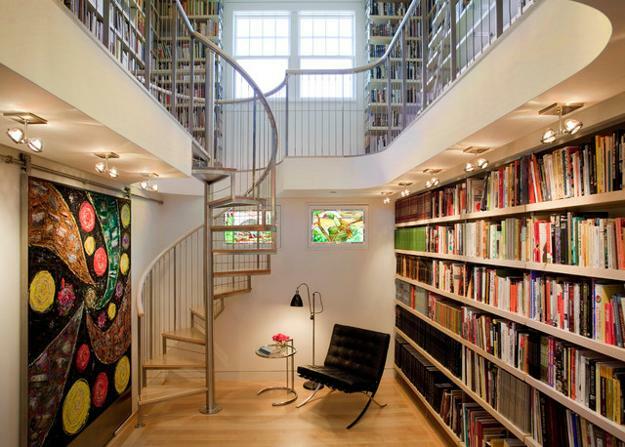 The look, material, and quality of its design are important factors for choosing the best library ladder for your home. Aluminium or stainless steel design and composite models bring a contemporary flair into modern interiors. 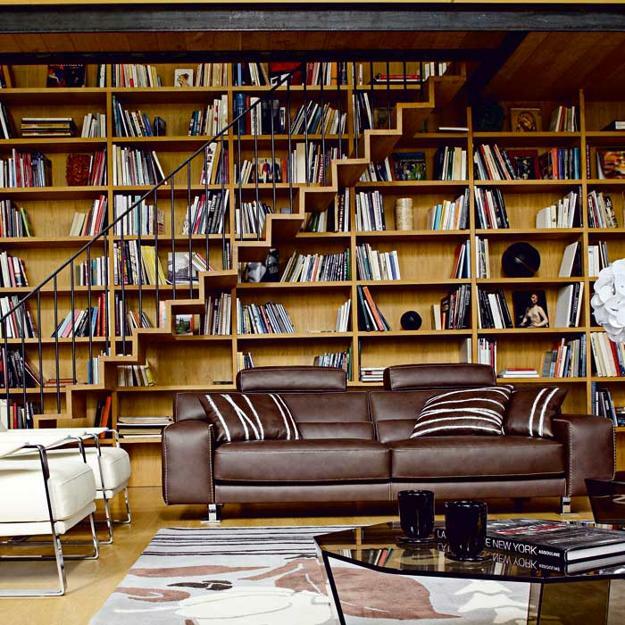 Wooden steps add classy chic to home libraries. 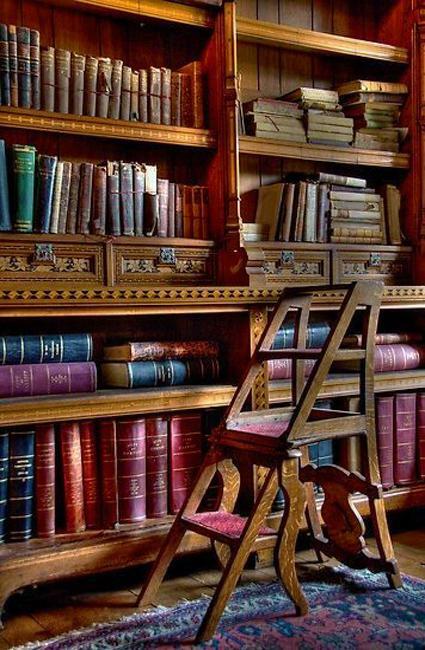 Rolling, sliding, stationary, tall or short, metal or wooden, new or vintage, – you have to select the one that is comfortable for you and complement your home library decor.